Santa and his helpers from the Transportation Department deliver candy canes to the elementary schools. 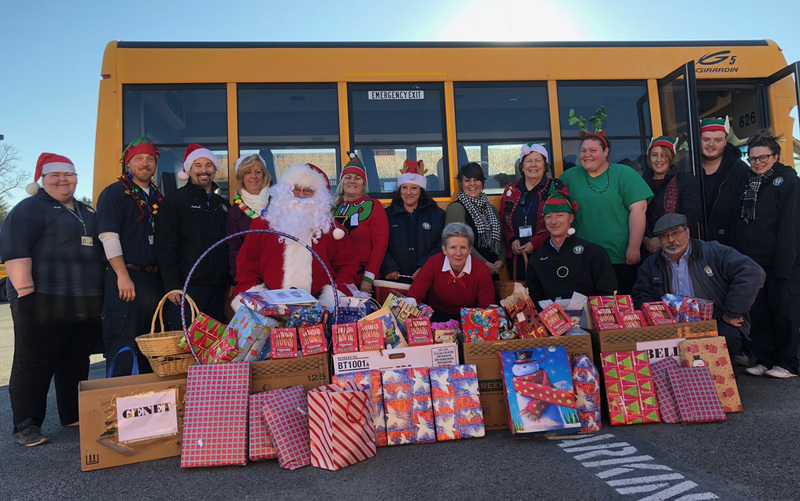 The East Greenbush Central School District Transportation Department is once again spreading holiday cheer by providing gifts for five district families. Through raffles and the generous donations of the staff, they were able to meet the needs of one family from each of our district’s elementary school. Throughout the month of December, the Transportation Department has also been taking donations of candy canes from local businesses and the districts PTO’s. “It has become a yearly tradition to have Santa and some of his helpers visit each of our elementary schools, and hand out candy canes. Without the help and support of our community, we would not be able to make this yearly event happen.” said Ms. Belmont.